I had no notion that MB had a hydrogen fuel cell motor-car operational in year 1994. What a revelation. But is not all this technology too expensive (to produce and to maintain)? If the environment is all-important, pollution (in manufacture and well as in use) is to be reduced? Would it not be better for the environment were we to drive motor-cars with small (low powered) petrol engines? Motor-cars, which are nothing more than boring transport - devoid of status and joy? Just a thought. Mazda has that philosophy, believing that petrol engines still have their place and has developed an air supercharged, spark controlled compression ignition petrol engine (which I drove in Portugal in February) that is very low CO2. In the UK half of all of the electricity is generated from fossil fuels, which means the average electric car emits at best 60g/km CO2, but from the power station chimneys rather than its exhaust pipes. That's why hydrogen fuel cells are more important and more relevant than plug in electric vehicles. 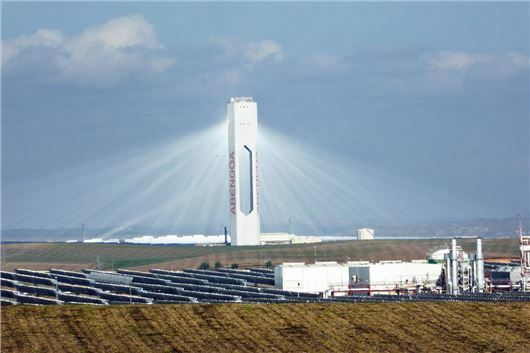 The cleanest way to produce electricity might be by solar power, as in the photo taken in Southern Spain. Mirrors on the ground reflect the sun’s rays to a boiler in the tower, creating superheated steam for the turbines. I have between £10,000-£12,000 to spend on either a Porsche Boxster or Audi TT to be used purely for pleasure. Which in your opinion would be the preferred option, bearing in mind running costs, etc. The Boxster will give you the more perfect drive. The TT (depending which one) should be cheaper to run and if something goes wrong should be cheaper to fix. The other car to consider is a Mazda MX-5 2.0i 6-speed Sport. Great to drive, but very little room inside it. I’m approaching partial retirement and my daily commute of around 45 miles round trip will only be necessary 2 days a week. I’ve been ‘wedded’ to BMW 5-Series cars for many years - and would describe myself as a petrol head. If I were to down-size to a petrol car what would you suggest should be on my ‘bucket list’? Budget would be £20k-25k. Annual mileage, probably around 12,000 in the future. That aside, I’m also really tempted to a 640d if I were to stay with oil burners. On the other hand Alfa Romeo has always been an itch for me. The only real Alfas these days are the Giulia and the Stelvio, both available with an excellent 2.0 litre chain cam 280PS engine but, unfortunately, way over your price bracket. A classic Alfa, maybe. We were driving behind an immaculate late 1970s Alfetta in Thailand on Monday. Well driven, too: not slowly. BMW 1, 2 and 3 Series are satisfying drives with 2.0 litre petrol engines. And you are, of course into VW Golf GTI/ SEAT Leon Cupra territory is you don't mind straying into 2WD. More powerful Mazda 3s are quite satisfying. And a 4WD Mazda CX-3 2.0 Sport is a bit like a Mazda MX-5 with some room inside. I am considering buying a Toyota Aygo for my daughter and grandson. He is about to take a driving test. Their preference is for an Aygo automatic, but the x-shift seems to be called 'a semi-auto'. What do you think of an automatic Aygo and what is a 'semi auto'? Hope you can help. Terrible automated manual with a high rate of expensive failure. (Early version tested here: /road-tests/toyota/toyota-aygo-2006-road-test/) Don't go near one. If you want a small automatic get a KIA Picanto 1.2 auto of Hyundai i10 1.2 auto. Both reliable 4-speed torque converter. I have been advised to get in touch regarding, what on the face of it appears to be a gross miscarriage of justice in relation to my Mercedes GLA. My car is 3 years 9 months old (although this fault developed over 2 months ago). The diagnosis from the Mercedes dealership is: "Inlet manifold and motor required as flaps in manifold are sticking. The total cost of this repair is £1,312.32. We have ESKULABED it to Mercedes and they have unfortunately not agreed to contribute any costs. (Damage code 0 09338H2)." My argument is obviously that a car of just over 3½ years old and a mileage of 46,000 should not develop an engine fault (which it is established can be no fault of my own or my driving), which costs £1,300 to repair. It seems outrageous to me that any car should do that, let alone a Mercedes - supposedly a 'premium, high quality' brand? And then for the manufacturer to take no responsibility whatsoever and offer no help, nor financial assistance to repair it just seems beyond poor. They have stated that on 'some' occasions they do offer customers 'goodwill' contributions to such costs, if the car has been serviced its entire life at Mercedes dealerships. My nearest MB dealership is 30 miles away, making it impractical so I have had all the services carried out by a local VAT registered garage by a fully qualified mechanic in strict accordance with the cars servicing schedule and using only Mercedes parts and oil, so I have fulfilled the requirements of the service needs. I have now exhausted (no pun intended) the Mercedes complaints procedures and am left with the only option: to go to the Motor Ombudsman. I now wish to get rid of this vehicle at the end of the year, but I need to get this issue resolved before I do so, because the engine management light is on permanently and the car is mostly in 'limp home' mode because of the fault. I would really appreciate your thoughts, advice and guidance on what recourse (if any) that I may have, or if I just have to swallow this disgraceful customer service and simply never buy another Mercedes? Thanks to your advice we are now the owners of two Mazdas: a CX-5 auto and a Mazda 6 Sport manual, 2.2, both diesels. I have an unexplained code on the CX-5 that looks like it’s to do with the DPF. My local garage can’t explain it so I’m hoping you can help? The CX-5 (HJ12THX) has 80,000 miles; main use is a daily 35 mile round trip. About 4 months ago the red “Check Oil” warning message would intermittently appear, but no other warning lights. It went in for a scheduled service and MoT to the Mazda dealer who said it was just the oil needed changing. That was about 5,000 miles ago. A couple of weeks ago the red check oil message reappeared intermittently. Then the following day my wife (it’s her car) reported the yellow engine fault light and, several miles later, the car went into limp mode. She limped home the last 3 miles, restarting the car about 5 times. Later, I took it for a test drive: the car did 2 miles from cold, but as it warmed up, limp mode would kick in more often. The AA picked it up and took it into a local garage that specialises in ECU tuning and were recommended (the main Mazda dealer couldn’t take the car for a month). The local garage said the oil was contaminated and said it wasn’t unusual in Mazdas. They changed the oil and filter and everything was OK. Ten days and 600 miles later the same thing: yellow engine warning light (not permanently on) but the car drives OK, no limp mode and the engine sounds fine. The dipstick shows oil is not too high (2mm over the top mark, but a long way below the X). The specialist garage diagnosed it and got the code 06DE, but no other information given by their diagnostic kit. I Googled it and saw some info about P06DE but nothing definitive. The garage thinks the DPF may need cleaning. Can you throw any light on this fault? Assuming it is DPF related, what do you advise? And am I looking at a costly repair? If not DFF then what? I recently purchased a 2007 Bentley GT with 125,000 miles recorded. The car was originally purchased from and maintained by Bentley Leicester (receiving two services per year and whatever other work needed doing). I know this as I bought the car from my brother who has just taken delivery of a new model GT. I have noticed corrosion and paint peeling in three locations. I am struggling to get information regarding the length of the Bentley anti-corrosion warranty. Can you advise? Also the level of service I have received has been poor. Over 2 months ago, I visited Bentley Leicester to have the service book updated and asked them about the corrosion. They called me back 6 weeks later to tell me the car needed a service (which it didn’t). When I mentioned the corrosion, I was told the claim had been rejected due to the age/mileage of the car and the fact they had undertaken some previous bodywork on it. After initially suggesting that I speak with Bentley customer services the lady then advised they had someone from Bentley calling over that Thursday and she would raise the matter. I heard nothing so three weeks later I called Bentley customer services to be told they had no record of any claim against that vehicle registration. They said they would ask the dealer to call me the following working day. I asked customer services to call me back, and not go through the dealer as I was not happy with level of service I had received from Bentley Leicester. Two days later, Bentley Leicester called me back to confirm that Bentley had rejected the claim. But I now should be able to discuss it with customer services, leading me to believe that after 3 months the matter has only just been raised with Bentley. I am not sure whether the warranty is 10 years or maybe it is 12 years? If it is 12 years, surely it should be honoured if the paintwork/bodywork has been done through a Bentley dealership? Even if it was 10 years I would have expected a more professional approach and level of communication. My recently-acquired 2001 Lexus LS430 seems to have something draining the battery when not in use. After 3 or 4 days standing it won’t start. The battery and alternator have been checked and there are no obvious lights on when it’s parked up. Any ideas? What often happens is that the interior light delay switch remains live after the light has gone out and then drains the battery. Try switching the interior light off altogether so it does not come on when you open a door. You should also always lock the car even when left in a garage. If you don't, the car's Bluetooth can continually search for its paired phone and that also drains the battery. 100PS or 125PS, and which engine is most suitable for mainly around town 6k and motorway 2k miles per annum? The car would have 2 adults, two children and a disability scooter on board. It will need at least the 125PS version of the EcoBoost engine. Avoid Powershift transmissions. The Real MPG average is 36.8. The alternative is a Citroen C4 Space Tourer 1.2 Puretech 130. That engine has been more reliable than Ford's 1.0 EcoBoost. It also has more torque and the Real MPG average is 41.9. Last evening, I filled my 2010 VW Golf Plus SE TDI with petrol and drove off down a very busy dual carriageway with no laybys; this, after 62 years of trouble-free motoring. Net result today, an estimated £6k bill. Certainly more than the vehicle is worth, even in its VVGC with 62,000 miles. My fault, but on a later, daylight inspection of the Shell pumps, their colour coding is, in my opinion, ‘iffy’. Firstly, do I claim on my insurance and what could I expect? Secondly, is there a Honda equivalent about 3 years old that is a possible replacement, taking into consideration an elderly passenger with impaired mobility? Some insurers will accept claims for this. Having misfuelled once myself (10 litres in a 6 litre tank) and got away with it, I'm now very careful to inspect the pump nozzle before pulling the trigger. Shell pump nozzles are clearly marked. The Honda equivalent is the Civic 1.6iDTEC. Significantly more economical: 65-70mpg and they always had misfuel prevention devices. According to the owner's manual for my 2014 Lexus IS300h, the rear differential fluid needs replacing at 20k miles, which is perfectly understandable. However, the CVT gearbox fluid needs replacing at 40k miles and, even then, the dealer has said they usually only "inspect" the fluid and generally replace it at 60k miles. In any event, with the close proximity of the heat from the engine, together with the complexity of the integral chain and gearing system in the CVT box, the fluid, one would assume should require changing at 20k miles, the same as the rear diff. Your technical advice would be very much appreciated. Confession time. I'd never heard of the requirement to change the limited slip diff fluid in a Lexus IS300h at 20k miles, or any requirement to change it in any car as frequently. The combined Haldex clutch and rear diff on an Audi quattro requires regular changes of fluid, but that is for a 4WD car where a 'wet clutch' is involved that burns the fluid. CVTs do require regular changes of fluid, but if a Lexus dealer is finding that on a Lexus the change is not necessary until 60k miles this must be from experience and he is taking the implied liability for not changing it. I've never ever heard of epicyclic CVT failure on any Toyota or Lexus CVT transmission, though I have on Honda CVTs where the change of fluid has been excessively neglected. I have a 2012 Nissan Qashqai N-Tec CVT, purchased in December 2016 by a reputable garage on our behalf on the Internet. Mileage 16,000. The gearbox has suddenly become very noisy. The reason diagnosed by the garage is oil starvation due to a technical fault in manufacture. Nissan is completely disinterested in helping or solving the problem. The advised solution is a new gearbox at a cost of £7,500. I am 85 years old so have many years experience of buying cars, but have never encountered this problem in an automatic car before. Your help in finding a cheaper solution would be very much appreciated. Does a cheaper solution exist? And should Nissan not be a little more helpful as it is inherently a technical problem? I’m retiring soon and could purchase my 3-year old company car: a Peugeot 508 RXH. I’ve loved driving this car: more, in fact, than its predecessor Audi Allroad, but would it continue to be trouble-free for two or three more years? Your thoughts on this rare beast’s reliability would be greatly appreciated. I wouldn't. It's a very odd combination of diesel engine (not good), hybrid system (good) and automated manual transmission (not good). Peugeot is about to launch an entirely new generation of hybrids, but not with diesel engines. In December 2016 I bought a Vauxhall Zafira Tourer petrol turbo from Vauxhall, Staples Corner, London. The car is ex-Motability and was first registered in February 2016, with a manufacturer warranty expiring in February 2019. It had only 3,000 miles recorded. The vehicle is only used by me as an Uber driver. Around 22nd August the car started to make a deafening noise. The day after I rushed to a Vauxhall garage to find out the problem and I was told the car needed an oil turbo return pipe; the parts was not available in the UK as had to be ordered from Germany. I ordered the part, paid for it, and expected it in a week or two. The part eventually arrived on 15th October, after 7 weeks. In the meantime, the car started making fumes and loosing oil. I booked a repair on 16th October, early morning, at 4 pm of the same day and received a call from Vauxhall telling me that the car has a cracked turbo, and a list of other problems requiring repairs totalling £2,000. I rushed to the garage (and I emphasize that the car is under warranty until 60,000 miles or February 2019, whichever comes first.) My car is in their workshop now since yesterday and I have been told that my warranty is void as my first service in May 2017,was done at 15,000 miles and the 2018 service on the 25 April 2018, was done at 45,000 miles. They are standing by their rule that car service should be at intervals of no more than 20,000 miles or annually, whichever comes first. Now I have been totally misinformed by Vauxhall, as the service mileage interval was never explained. If it had been I would have had the car serviced every 19,000 miles just to be on the safe side. Tell me, what shall I do about been misinformed, and where do I stand now? Unfortunately you have brought this on yourself by failing to have the oil service when it was due. We recommend an oil service every 10,000 miles or every 12 months whichever comes first. If Vauxhall says 15,000 miles, then that is critical with a turbocharged engine. The problem with the oil feed and oil return pipes of a turbo is that if the engine is often switched off when the turbo is too hot the pipes become blocked with carbon, starving the turbo of oil and leading to turbo failure. When the problem first arose, the oil return pipe should at least have been cleaned out. But because the car has not received an oil service for 30,000 miles, Vauxhall cannot be held liable for the failure and any case you may take against the supplying dealer is likely to fail for that reason. The cars for sale section is listing two Giulia Veloces at the top of KM's price range with Supers quite a bit less. Buying an 11 year old luxury car is a very brave thing to do, only for gamblers and the massively confident. But buying one from your brother - foolish all round!! Transport gor London had a trisal for hydrogen powered buses about twenty years ago, none of the routes were nearby, but one of the refueling stations was on the east bound A127 near where I used to work. It was completely demolished after the trial, though a BP petrol / diesel garage remains on the site. The buses were spectacular in operation, a plume of water vapour at the rear made it look like a steam bus! PGD contends that hydrogen fuel cells are more relevant than plug in cars because, with plug ins, the CO2 simply comes out of chimneys instead of the exhaust pipe. Unfortunately there is no natural source of hydrogen except to take water and break it down into oxygen and hydrogen, using a lot of energy, that being electricity. So it suffers in exactly the same way, CO2 is still produced. And there is the infrastructural problems of manufacture, supply and storage associated with hydrogen. Filler Killer - Fords have a fuel inlet which prevents this regardless of being petrol or diesel. All manufacturers should have them. But the golden rule is check then check again. yes Ford's have had the EasyFuel system for a while and other manufacturers are very slow in adding similar systems to prevent this kind of issue. Shell have clear markings, black for diesel and green for petrol, unless the local station had a mistake made when pump was serviced.